Dr. Ya-ping Su is the Director of Research and Analytic Services at Healthcare Quality Strategies, Inc., (HQSI). Since joining HQSI in 2001, she has used her expertise in the applied health service research to design, implement, monitor and evaluate quality improvement and other healthcare-related projects. From 2008-2011 Dr. Su was the co-leader of HQSI’s successful New Jersey Care Transitions project, part of a Centers for Medicare & Medicaid Services (CMS) pilot undertaken by 14 state quality improvement organizations. She continues to work closely with HQSI team leaders and stakeholders across the state regarding studies, data collection instruments, and survey tools related to care integrations and reduction of avoidable hospital readmissions. She also teaches, trains, and coaches healthcare providers and staff in appropriate study design, data collection and evaluation methodologies to achieve desired outcomes. She currently serves as a project consultant to Robert Wood Johnson Foundation and Grotta Fund in their care transitions initiatives. 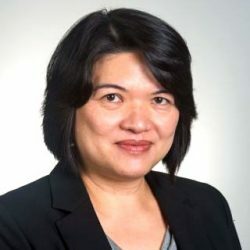 A graduate of Purdue University, Dr. Su is also a reviewer for the Journal of the American Medical Women’s Association, Journal of Aging and Social Policy, American Journal of Public Health, Journal of Gerontology and the Gerontologist.